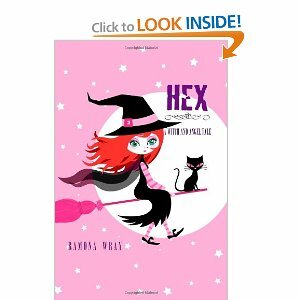 Seaside Book Nook: Hex, A Witch and Angel Tale plus Giveaway! Synopsis: Like most girls at Rosemound High School, seventeen-year-old Lily Crane is acutely aware of Ryder Kingscott. Hands down the cutest guy in school, Ryder is cool, mysterious, and utterly untouchable…especially for Lily. For when she touches someone, Lily instantly learns all about their lives. And while such a skill might seem nifty, in truth it is wrecking Lily’s life. So she is shocked when Ryder asks her out — and even more shocked to discover he has a rival. Lucian Bell is the gorgeous new kid who can’t take his eyes f of Lily. Being pursued by two hotties should make a girl happy, but Lily is skeptical. The boys act as if they’ve met before, hating each other with a passion that could only be rooted in a dark, dangerous past. A past full of terrible secrets. The kind of secrets that could get a girl killed. My Review: For me this book was wonderful. Wray has written an amazing book and I love her style. I can only describe it as Meg Cabot (Avalon High) + Sarah Mynowski (Magic in Manhattan Series) + Stephanie Meyers (Twilight Series, substute vampires for witches and angels) = Ramona Wray's Hex, A Witch and Angel Tale! I also have to confess, that I love books about witches and I have always wished I had some "good" witch in me. Back to the book....I read this book in three days (that is something for me). I couldn't wait to find some time to get back to it. I think Wray weaves such a great story with great characters. The book consistently had me wondering who was good and who as evil. Ryder and Lucian....do I need to say more? I couldn't wait to read more about them and in my mind....they are so cute! Lily....who couldn't love her? I recommend this book to anyone and everyone. It was great. Rating: Great Read! Totally Recommend for young adults and older! 1. I just loved this book and know that you are currently working on your next novel. Is the next book part of series or a completely different? I would love to see what Lily and Ryder do next. Hi, Jilleen, and thank you for having me. No, Hex is a stand alone, sorry about that. My new book is called "Echoes". It?s dystopian, and very different from Hex. But, like Hex, it has a female MC who is both likable and unusual. I think you'll like her. 2. Do you have set hours that you typically write, or when the mood strikes? You know, I write whenever I can. Everyday life sometimes gets in the way, so I can't afford to be picky. But I'm probably at my best very early in the morning. 3. Do you have a special place that you write, or wherever you can find? I just moved into a new house and I have this amazing room which I converted into a library. It's not quite ready yet, but still ... Great :-) Huge arched window. So lately that's where I write. But generally, I tend to follow the quiet (even if, sometimes, that means locking myself in the bathroom). Impossible to pick just one. Jane Austen, H.G. Wells, Oscar Wilde, Henry James. Sarah Rees Brennan, Holly Black, Jenny Downham ... I think I'll stop here. 5. What book (besides Hex) would you recommend? I just read The Iron Thorn, by Caitlin Kittredge. It was pretty amazing. 6. Are you able to read other book(s) while writing? I couldn't go a day without reading! But I get what you?re saying. No, I don't think that reading other authors while I'm working on my own book is a bad habit. Once I've got the story in my head, I don't get derailed or influenced. But I do need to escape to different worlds, especially at the end of the day. Writing can be very consuming. 7. What is a fun fact about yourself? I often dream about my characters. 8. Did you know you would be author? It would be a dream come true for me. Surprisingly enough, no. I mean, I've written since I was a child, but I never thought about taking it to the next level. I have a fickle nature, so not too many things hold my interest for long. As I neared my thirties and realized I was still writing, I thought ?Hang on! This means something.? So then I began to seriously look at publishing. Without a doubt, pie. It's a tie between chocolate cream and raspberry. 10. Favorite thing to do when you are not writing? Spending time with my son. Reading. Running. Giveaway: The best news.....I have two books to giveaway! Enter to win by becoming a follower on this blog and posting a comment letting me know. If you are already a follower, just leave a comment stating so. Extra Entries - make sure you post an comment for each one. 2. Go to Outnumbered 3 to 1 blog, become a follower and post a comment on that blog stating you are now a follower (or state you already are a follower of GF) and an extra entry! Contest is only open to US residents and the contest will closed midnight EST on April 10, 2011. Its a good thing you aren't moving back cause you'd never have time to work on your blog! I really enjoyed the author interview. The book sounds right up my alley. I am a follower on GFC! Please enter me. Thanks! I am an old follower on Outnumbered 3 to 1, and I left a comment. New follower from Out-Numbered-3-to-1 :) Great giveaway! !